SAMA is a hand painted, digging and puzzle adventure where you take the role of a mining ship and the little Alien blob crew hijacked by a pirate ship. Your Aliens have to dig, fight and puzzle their way through the subterranean worlds fulfilling the ransom demand. Can you do it? Today we start with our Alpha testing! 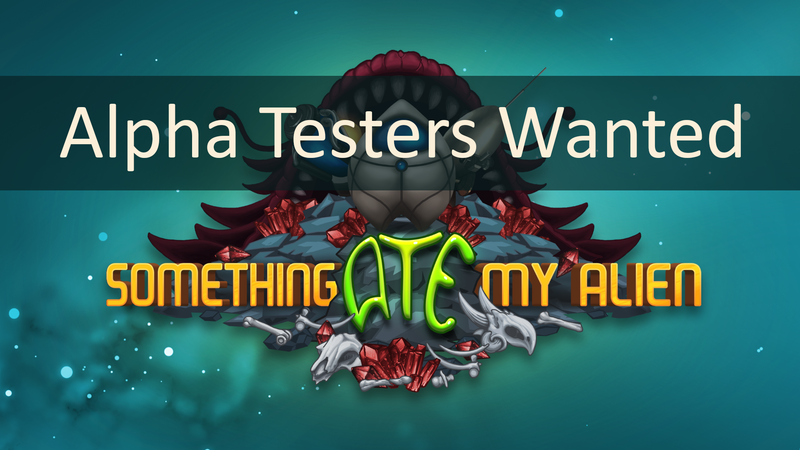 If you would like to help us testing our game, click the link below to get to our forums and read about how to apply. Thanks for joining the SAMA group. My name is Rob and I'm the programmer for the game, and my partner Kat is the artist. Between us, we have designed and written the whole game ourselves. We've been developing the game since the end of 2016, and we are now getting to a point where the game is nearly ready! Soon we will be entering an 'Alpha' testing stage, so look out for that announcement if you want to be involved with that. In the mean time, if you want more to read then head over to our website or social media accounts. Something Ate My Alien is a 2D, digging and puzzle platformer game where you take the role of the AI Antalasia, and control your little Alien blobs to explore the planets you visit! Your task is to dig through the ground of the different worlds and find all the items required by the pirate that is hijacking you. During the adventure on each planet you have to battle environmental dangers, fight off wildlife, solve secret puzzle chambers, and all this while surviving on a depleting oxygen supply and a threat far scarier than the local wildlife. The ransom list you need to complete is randomly generated and unique to each game. Dig through the depths of 4 different planets and collect as much loot as possible. Solve puzzle chambers by pushing and pulling blocks to reveal secret treasures. Survive by finding oxygen recharge stations and dodging environmental obstacles. Fight the hostile flora and fauna with your choice of 6 specialized weapons. Upgrade your equipment by selling surplus loot for units. Engage in bigger battles with the scary huge threats guarding the hidden secrets. Guide the Aliens to find all the resources the pirate demands, and any additional items you find you can sell for extra units. Some planets are rich in gems, others in specific minerals, fossils, artefacts or gases. Collect as much as you can! Each planet has an array of puzzle chambers that once solved reveals hidden treasures. Pull and push the blocks into the correct positions to get the tokens containing parts of the code you need to unlock new places and move your adventure forward. Your Aliens need to survive in the perilous environments while digging and exploring. Find oxygen recharge stations and beware of pools of corrosive, super heated or poisonous substances, falling rocks, slippery ice, toxic gases and open flames. There are 6 unique weapons all with different mechanics to defend yourself against the abundant flora and fauna. Look out for charging animals, flying creatures, armoured beasts and be careful walking underneath hanging fungi. Sell your surplus loot and use the units to buy blueprints for upgrading your equipment. What do you want to spend your hard earned cash on? Faster mining? Better guns? Bigger oxygen tanks? Longer lasting jet packs? Or perhaps something else to aid your Aliens while exploring the caves?